Parakeets can assist each other with unsheathing new feathers. When your parakeet is born, he doesn't have any more feathers on his body than you do. It takes a few weeks for them to grow out -- and for the rest of his life, he'll keep on shedding feathers and growing new ones. Growth rates vary from bird to bird, but the general process remains the same. When a parakeet's feathers sprout from the skin, they don't look quite like feathers; they look more like little spikes. This is because they're encased in sheaths that gives them pinlike appearances, hence their name: pin feathers. As pin feathers emerge, the parakeet, or another bird, will remove his sheathes, allowing the feathers to take shape. They may appear crooked or uneven at first, but they smooth out over time to give him his trademark sleek and colorful appearance. A parakeet is born naked and with translucent skin. While he doesn't have any feathers on his body, you can actually see the pins appearing beneath the surface of his skin within his first week of life. Around day 7, his feathers start emerging and growing outside of his body, growing consistently for several weeks. His feathers are completely grown in when he is about 4 or 5 weeks old. Like other birds, parakeets molt, or shed and replace feathers. Sometimes these feathers fall out naturally; other times, your bird plucks them himself, allowing new ones to grow. The molting schedule depends entirely on the bird's breeding and environment, and varies from bird to bird. Your parakeet's molting schedule can be drastically different from another bird's. This has to do with temperature, hormones and diet -- if you're concerned about your parakeet's feather loss, you should see a veterinarian. Feather loss and regrowth -- or lack of regrowth -- isn't necessarily a normal stage of life. 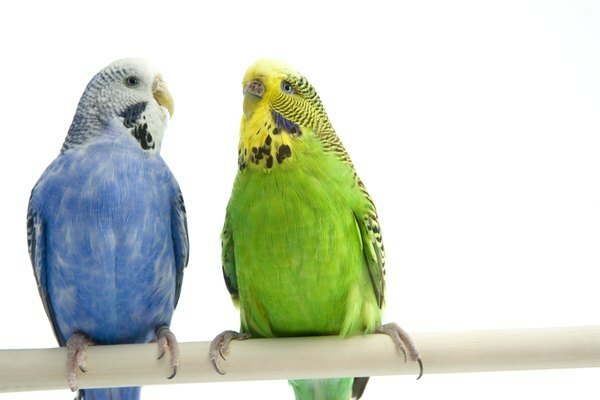 For example, if your parakeet excessively plucks his own feathers to the point of leaving bald patches, he may be experiencing allergies, anxiety or other problems that your veterinarian may be able to identify. Similarly, when a pin feather is growing, it can break and cause the blood vessel inside to bleed. Left untreated, it can hemorrhage a fatal amount of blood. A veterinary hospital can help you treat a broken pin feather. What Does Keratin Do for Birds?